We’re now open after hours! We have extended our opening hours until 7pm on Tuesdays and are now also open from 8am - 12pm every second Saturday, so there are no more excuses to skip your annual skin check. Book now to schedule your head-to-toe exam. It might save your life! 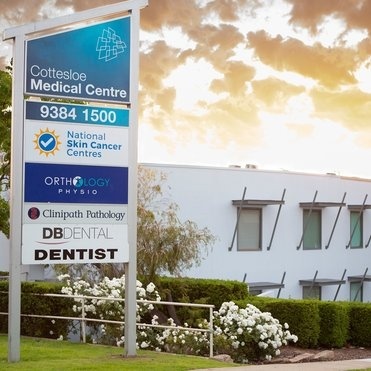 National Skin Cancer Centres Cottesloe provides expert consultations, prompt diagnoses and efficient treatment of skin cancers and related skin conditions. Combining unparalleled technology and expertise to evaluate your skin health from head to toe, all our doctors are specially trained in Skin Cancer Medicine and can conﬁdently guide you through every stage of the process from diagnosis to treatment. Our team is supported by highly trained staff including registered nurses and patient coordinators who will carefully address your skin cancer concerns utilising the latest technology, including full-body photography. After taking a thorough clinical history, we can use the revolutionary Canfield IntelliStudio skin imaging system to take a series of digital images of your whole skin surface, providing detailed images and diagnostic evaluations to deliver the best outcomes for you. Quick and accurate total body imaging delivers consistent and comparable results, is completely painless, and you can follow the exam on the screen. Subsequently, your doctor will examine your skin from head to toe using a hand-held microscope called a dermatoscope. Full-body imaging is the most reliable means of accurately tracking changes over time and producing potentially lifesaving results as the high-resolution images allow easy side-by-side comparison at follow-up appointments. With sophisticated software and superior expertise working together for exceptional accuracy, your doctor is able to reveal the most subtle skin changes (from 1mm!) 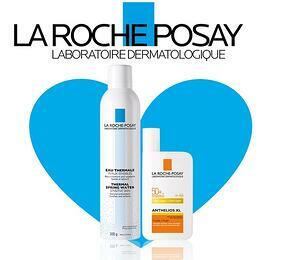 and detect skin cancer at its earliest stage when it is most manageable and requires least invasive treatment. As new or changing skin spots are the first indication of skin cancer, you can be assured that no melanoma goes unnoticed. Our skin cancer doctors and nurses are equipped with the necessary training to seamlessly operate the IntelliStudio system, for your utmost peace of mind. You can find out the true condition of your skin with a free skin health assessment at our centre. We use Canfield’s Reveal technology to uncover hidden sun damage beneath the skin’s surface, enabling you to be better informed about your overall skin health. 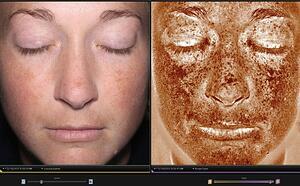 For a limited time, you can receive a skin health assessment with the Reveal Imager for FREE. Private consultations are available with a qualified skin cancer nurse. *Introductory offer. Limited spaces available. We are dedicated to providing the best standard of patient care without compromise. Our highly qualified doctors will address your skin health needs promptly and efficiently, and our specially trained support staff will minimise waiting times and ensure your experience is as pleasant as possible. National Skin Cancer Centres Cottesloe is a private billing facility. We offer several payment options, including cash, EFTPOS and credit card. For your convenience, we use Medicare online so your rebate will be refunded promptly. Please ask our staff for more information. All patients $60 out of pocket, excluding VA gold card holders. $132.80 payment on the day for a standard consult, with a $72.80 Medicare rebate. If the doctor does anything extra as part of the consultation, there could be a further charge on the day which will be rebated by Medicare, but patients should still only be out of pocket by $60. All patients $50 out of pocket with no Medicare rebate. Theatre fees will vary depending on the complexity of the procedure. Please ask our team for more information.